Search from options available at this moment. Actual years which are available TODAY are options on the drop-down menu. Find the fire truck you need! By location. To search by location, click on the map. You will be provided with a list of apparatus located in that region of the country. You may then sort the list and how you view it with the "LISTING/ GALLERY" tool. Might as well be brand new! Excellent walk-in rescue. RESCUE TOOLS included, click for more details! Negotiable. 2006 F-550 AWD Walk-Around Rescue - Excellent Condition! Very low miles. We only see 4-door 4x4 Walk Around Rescues like this about once a year. Last one like it sold May 2018, before that it was June 2017. Now's your chance! 1000 water, top mount pump panel, light tower, high sides and more! To be sold with current aerial cert! Big horsepower (475) on this Rescue-Engine! This has seen little action and is readily available to work in your community! Open to Offers: Let's Talk! Hardly used: Air/Light/ Command unit with compressor & cascade...check out what's included! 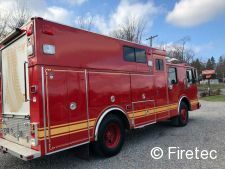 1997 E-One Pumper - Priced to Move! Low miles on this well-equipped pumper. Nice rescue pumper, 500 water tank and 50 foam. Compact Custom Pumper - 1500 gpm/ 1000 tank - 9'10" high and under 32' long. 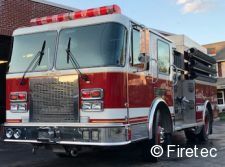 Excellent condition on this compact, easy to maneuver pumper. Sweet Deal -- $15k OBO! 1000 gallon tank and 6kw generator. Enclosed seating for 6. 1250 Gpm Hale pump on this Ford/KME. Tanker Pumper - 2500 gallons!